Baltimore, MD, November 13, 2006: Intralytix, Inc., announced today that it has won the Popular Science "Best of What's New" award for its food safety product ListShield™. ListShield™ is a bacteriophage-based product effective against Listeria monocytogenes, a deadly food borne pathogen. ListShield™ has recently been approved by the Food and Drug Administration as safe and effective for use on ready-to-eat foods. "We are very pleased by Popular Science's recognition of our breakthrough technology" noted John Vazzana, the company's President and CEO. "Our technology uses naturally occurring organisms to eliminate bacterial contamination. It is one of the most natural and environmentally-friendly ways for improving the safety of our foods." Mr. Vazzana also noted that the company will be seeking regulatory approval of similar food safety products, protecting food against pathogens like E. coli and Salmonella. Each year, the editors of Popular Science review thousands of products in search of the top 100 tech innovations of the year; breakthrough products and technologies that represent a significant leap in their categories. The winners of "Best of What's New" are awarded inclusion in the December issue of Popular Science. "Best of What's New is the ultimate Popular Science accolade, representing a year's worth of work evaluating thousands of products," says Mark Jannot, editor of Popular Science. "These awards honor innovations that not only influence the way we live today, but that change the way we think about the future." Intralytix's award comes in the Personal Health category. 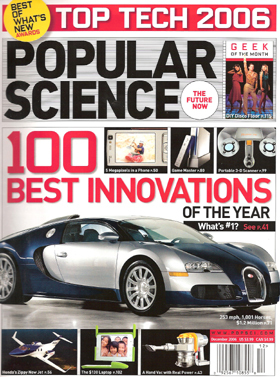 Phage Therapy has been chosen to receive a 2006 Best of What's New Award from Popular Science. Each year, the editors of Popular Science review thousands of products in search of the top 100 technical innovations of the year; i.e., breakthrough products and technologies that represent a significant leap in their categories. Best of What's New awards are given for 100 new products and technologies in 10 categories: Automotive, Aviation & Space, Computing, Engineering, Gadgets, General Innovation, Home Entertainment, Home Tech, Personal Health, and Recreation. 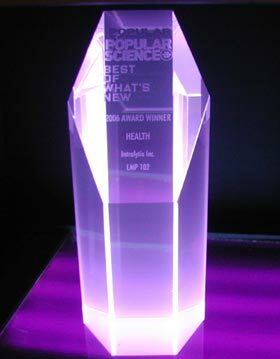 Phage Therapy received the 2006 Best of What's New Award in the Personal Health category. "Best of What's New is the ultimate Popular Science accolade, representing a year's worth of work evaluating thousands of products. These awards honor innovations that not only influence the way we live today, but that change the way we think about the future."